Veterans Day – Honoring Our Nations Heros Past And Present - Roberts Architects LTD Roberts Construction Group, Inc.
Monday November 11 is Veterans Day. World War I ended officially on November 11, 1918 and it was called Armistice Day to remember “The Great War”. Many of us know a family member, friend, or know of someone that served our Nation. Even if you don’t know someone, Pause, take a moment during your busy day to remember our Nation’s Veteran/ Heros past and present. Both of my Grandfathers fought in World War I and came home to build their lives and families in Chicago where my parents where raised. Going back further: My Great Great Grandfather John Augustine Smith 1832-1904, a US Naval Academy graduate fought in the Civil War and was a POW for two years. and Even further back My Great Great Great Great Grandfather Thomas Roberts 1730-1811, a corporal in the Virginia 15th regiment that fought in the Revolutionary War. 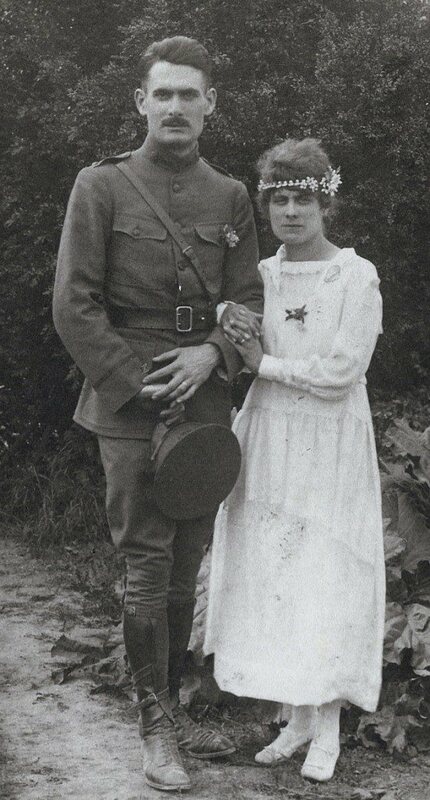 Pictured below is 1st Lt Walter B Roberts of the US Expeditionary Force and my Grandmere, Marie Louise Arnoud on their wedding day in Villiers En Lieu, France 1919.